What is the deal with pain? 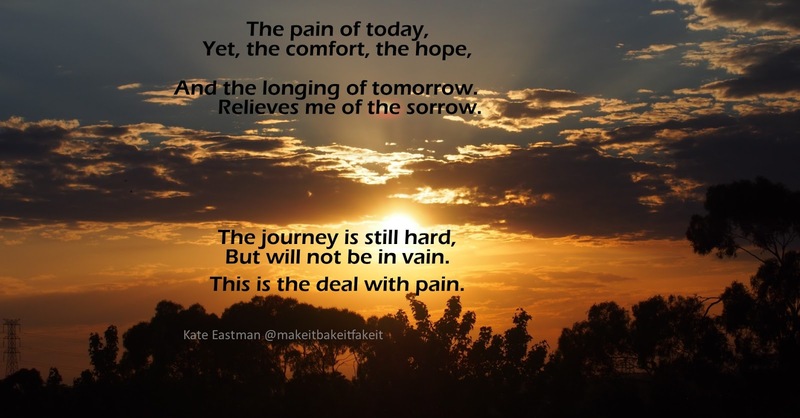 I have been pondering the concept of pain lately...my body keeps throwing these curve balls at me...and some days the pain has been off the chart. Completely random...like how can your scalp hurt so much that you cannot find a comfortable way to wear your hair? Or your gums ache like they have been flossed by wire when you haven't flossed your teeth in days (don't tell my dentist that one!)? Yet, as I contemplate this...I am drawn back time and time again to the 'why'. And time and time again I am reminded of my faith. It's hard to explain...yet when you are lying there in pain, and you cant cope any longer with how your body is reacting, deep down inside you are reminded of hope. A hope that transcends anything physical of this world. That reaches way beyond the here and now. Beyond the excrutiation. Beyond the life on hold. Beyond the high potency pain killers that are not even making a dent. I honestly don't know how I could be doing this journey without hope. So, out of that hope came these rather poetic ramblings of pain and my faith. Had no intention to pull out a bit more poetry so soon...it just happened! What does it have that leaves such disdain? Why does it encroach on all aspects of your life? Why is it the instigator of such strife? How is it so off the chart? This hand it has dealt. Is different friend to friend. In the midst how do you find the joy? Or is it really all just a ploy? Yet, gives you so much grace. You feel the pain that more than bothers. Who knew what was in store. A death, yet not a loss. Future heaven now my gain. I can now grasp it was for me. This life is not what will remain. The pain still entangles, engulfs. One day the pain will be no more. And the longing of tomorrow. Relieves me of the sorrow. But will not be in vain. 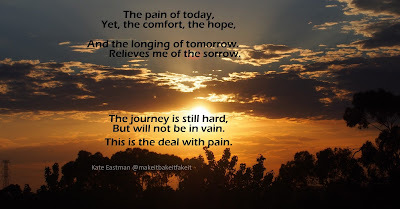 This is the deal with pain. They ( the medical professionals) did not know what was going on with my body. So, with Asthma being the only diagnosis, I was cleared to do Tough Mudder. That being said...I'm pretty stubborn, so I probably would have decided to do it anyway. Especially after ALL the training that had happened. Anyway, the day arrived, and I was pumped! And scared...oh so scared. Would little old me who had been unfit for so long in the past, really be able to complete the equivalent of a half marathon with a ton of crazy strength obstacles in between. But, I was doing it as part of a community. And the aim was no man left behind. 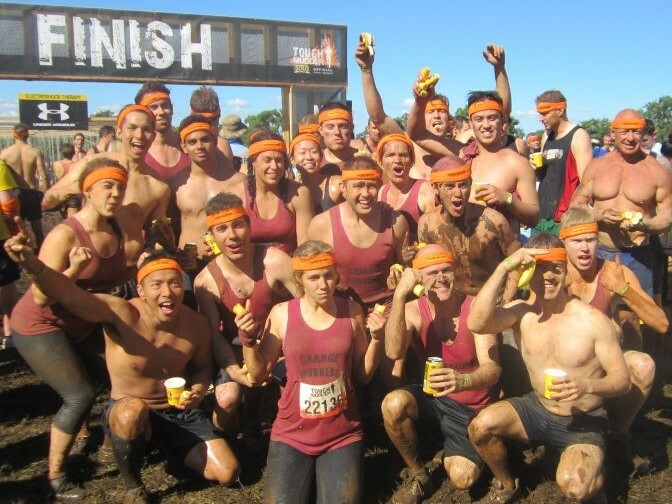 The idea of Tough Mudder is that you help your fellow competitors, it is a team effort. You may have never met the person in front of you...but their aim was to help you through, likewise, it was my job to help the person behind me. Every person had a part to play. Tough Mudder has reminded me a lot of what life with a chronic illness is like. Because you can't do it alone. You can't face all that life whilst you are sick alone. You need a helping hand. You need that team around you encouraging you to do your best, helping you with your weaknesses, training and doing life alongside you. You need others around you being vulnerable admitting that they too are freaked out by what is ahead. You need that friend running beside you at kilometre 7, counting you through the next twenty seconds...taking life one tiny chunk of life at a time. You need that friend jumping with (ie. pushing) you into the water when the height has you paralysed with fear. You need that friend challenging you as another setback leaves you struggling to take that step forward. You need that stranger reaching down to yank you up and over wall in front of you. It is amazing how the kindness or a simple act by someone you don't really know can make a difference in your day. You need that person who yanked you out after you got zapped by the electricity and you are frozen...those people in your life who pull you out of the dark spots and encourage you forward onto the next challenge. You need that friend who encourages you that "you can do this" as they give you a leg up and over the wall, over the next hurdle that life throws your way. You need the people in your life who are waiting with arms outstretched when you are freaked out running directly at a slippery slope and you can trust will catch you as you fling yourself upwards. You need those around you who will catch you as you scale your Everest. You need those friends and family members that will forgive you when you snap at them, when the fatigue, the pain, or the heartache has got all too much. You need that person giving you the extra push up the hill...spurring you onto perseverance. You need people around you who don't comment or make any mention of the fact you are the slowest on this journey, but instead stop and wait and allow you the time and space to catch up and do things in your body's timing. You need the people around you who know that life...just like an obstacle course race...is a team effort. Who start strong with you, who walk/run the journey together, who are moving towards a common goal, who are helping others along the way who have joined the journey, bringing others with them, to finish the race well together. May my journey through chronic illness be run with perseverance. May my eyes be fixed on Jesus. May I not grow weary and lose heart! Walking (and running) through life with a chronic illness you need those around you to celebrate with you. To celebrate the small wins, to celebrate the big. You need those alongside you to encourage you to persevere and point you to the finish line. To encourage you so that you do not grow weary and lose heart. So, I completed Tough Mudder. I both loved it and hated it. A mere three weeks later I was officially diagnosed with chronic fatigue syndrome. I look forward to the day I can complete Tough Mudder again, this time without a chronic illness. I hope that when I do, I can have the same team running the race alongside me. There are a whole range of favourite things that you begin to miss when living with a chronic illness. Your life has been completely turned upside down, and quite rapidly. There are things in your life you can no longer do, and a whole new world of illness, appointments, medications and a whole whole whole lot of time is spent at home. There are the typical things that you might easily imagine a person may miss…having a social life, being productive at work, career aspirations, playing sport… to name just a few. But there are also some more unique ones. This list may vary from person to person…but for me here are some of the big ones. 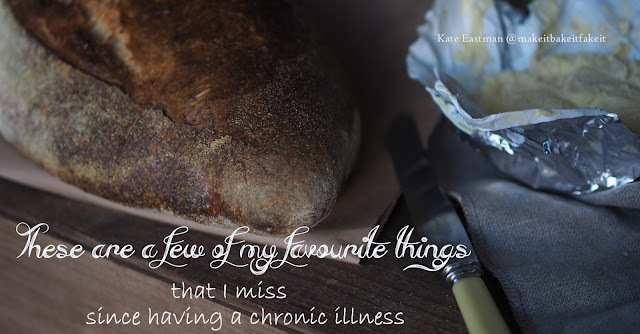 So here are some of my favourite things that I miss since having a chronic illness! I used to love having an excuse to buy fun new exercise gear. A new tank top in a fun colour, a bright sports bra, or a new pair of runners when shopping overseas. Now, sadly, I have no excuse to buy such products. My supply I had built up from exercising most days in the week, can easily suffice for my three 15 minute walks a week. Hanging for the day when I can again splurge. I presume this will correlate with the day I can again run...I miss running! I miss running…and long walks on the beach. Whilst we are on the clothing topic…I miss dressing up in professional clothes for work. I have a wardrobe full of cute dresses/tops/skirts that are just biding time waiting for the day I have an excuse to wear them again. Nowadays, my everyday wear consists of a comfy dress or shorts and a tee in summer, or a pair of jeans in winter. If I am feeling like rubbish and am spending the day moving from the bed to the couch then a pair of trackies and a hoodie will suffice, and if I am feeling really really rubbish I may change my PJ’s each night before returning to bed. I now own multiples of my favourite PJ’s the same way in the past I would buy multiple pairs of my favourite super comfy jeans. Alongside not being able to dress up and head into work, is the fact I feel I no longer get to stretch my brain. All cognitive activity has been grounded. I want to be reading into educational practices, I want to be recreating and inventing innovative programs, I want to be expounding theology. Yes, I can still do this, but broken into 20 minute chunks of time and limited to three blocks a day. This does not get you far through an educational journal article, or a passage of scripture. What I would give to have a fully functioning brain again! I was wandering through a shopping centre in early November having met a friend for lunch at a café there. I had planned my parking details thoroughly (this was before my disability pass days). I had found a spot next to the closest entrance to the café. This parking spot had me just need to walk through part of a department store to get to the café. After a very lovely, very sugar filled, catch up with my friend, I stared longingly at the rows of high fashion shops in front of me. So close yet out of reach. Not enough energy to even consider a brief walk in that direction. Let alone the torture and expenditure that trying clothes on would be. I meandered through the cosmetic section of the department store on my way back to the car. My senses were overloaded with bright lights, swirling colours and aromatic fragrances. I wondered how long had it been since I had window shopped? How long since I had been to a shopping centre without a distinct purpose of getting in and out as quickly as possible with minimal energy expenditure? What a privilege it once was to be able to wander through a shopping centre without care or concern for health! Yes, you read that correctly, cleaning! A much hated, yet unfortunately, necessity by most of the general population. I disliked it immensely myself for many years. But there is something about being trapped in a house or a room, all day, everyday, that makes you want to clean. Not the fun spring cleaning- rearrange the house type of cleaning (I have always liked this side), but the dirty dishes piled up on the sink, floor that needs vacuumed, clothes that need washed sort of cleaning. It is there in front of you, needing to be done, yet, your body says otherwise. And instead you are forced to leave the messy house in front of you or risk using up the day or weeks energy deposit. So, yes, sometimes I even miss cleaning! When you live with a chronic illness everything needs to be planned. On the macro level for the months ahead, on the micro level of when you are going to be able to take your next break. I miss long days where a morning workout turned into breakfast, then Yum Cha and followed by a trip to the beach. I miss late afternoon texts inviting you out for dinner that night. I instead spend my days planning out the finite details of everyday. If I have two appointments in a day, scheduling in the need to come home for a rest in between. If I have an evening out for a family dinner, knowing that I need to rest the next morning. Planning my appointments late enough in the day so that in the morning I can get up, have coffee, rest, have breakfast, rest, have shower, rest, get dressed, rest and then be ready to leave the house. Nothing happens in my week. I rest. I watch TV. I have appointments. I have another battle with a government agency or my insurance company. Repeat. That is it. Period. Nothing new happens. All the appointments are ongoing. And my health varies only ever so slightly in a week. So come Sunday and making it out to church, or a phone conversation with family or friend there is nothing new to talk about. Nothing new happened at work or home. Nothing! The most exciting thing might be a rare positive government agency appointment or a new TV series. One week my car number plates were stolen. I was so excited that I actually had something different in my week to talk about! I miss long tasty meals out. I miss the conversations. I miss the ability to keep up with these conversations. I miss the wide variety of food. I miss really good pizza and pasta. I miss crusty bread and real butter. I miss spending quality time with friends. I miss a good glass of wine. I miss going out at night...going anywhere at night! I have always loved serving and caring for those around me. My heart breaks as friends and family around me are going through hard times and there is nothing practical I can do to help. I can't drop meals off. I can't come and mind the children. I can't give them lifts to appointments. I can't give and care in the way I would love to. However, I am learning the importance of a well-timed text message. A phone call or remembering appointments or events in the lives of others. Even though I can't do the practical, the everyday little things can mean the world to someone. These are a few of my favourite things I miss. I think one of my next posts should be about my new favourite things since having a chronic illness, because even though I miss a great deal, there are still many things I am thankful for and blessed abundantly by. What are some of your favourite things you miss?